Joe Leaphorn, a fictional character created by Tony Hillerman, a Navajo detective for the Navajo Tribal Police and is typically stationed in Window Rock, Arizona. Leaphorn’s last name is a reference to the ancient Minoan practice of bull jumping, about which Hillerman was reading as he wrote THE BLESSING WAY. At the time of his first appearance Hillerman’s 1970 Navajo detective novel THE BLESSING WAY, Leaphorn is already a veteran detective. Because Leaphorn was educated in a Bureau of Indian Affairs boarding school during high school and then completed a bachelors and master’s degree in anthropology at Arizona State University, his extended time off reservation leaves Leaphorn negotiating between traditional Navajo as well as white ways. Despite his lack of complete knowledge of Navajo rituals, Leaphorn is cognizant that Navajo beliefs are often important aspects of cases. In the early novels Leaphorn works alone; however, in later novels, he and, the much younger and more traditional Navajo policeman, Jim Chee, are tasked to be partners and solve cases together. Unlike Leaphorn, Chee is studying to be a Navajo singer, or hataali, and is much more sensitive to Navajo lifeways. Their very different temperaments often cause tension between the two, but together they are able to solve cases. Leaphorn was first introduced as a supporting character in THE BLESSING WAY. He then becomes the main character for Hillerman’s Navajo mystery series with Hillerman's next two books in the series, DANCE HALL OF THE DEAD, published in 1973, and LISTENING WOMAN, published in 1978. In the mid-1970s, Hillerman sold the rights to Joe Leaphorn to a Los Angeles-based agency called Bob Banner Associates to produce a movie version of DANCE HALL OF THE DEAD and, possibly, a serial television program based on the life of Joe Leaphorn. Hillerman was unable to use Leaphorn as a character in subsequent novels, even though neither the film nor television options proposed by Banner Associates were ever realized, until Hillerman was able to buy back the rights to his character. Leaphorn returns to Hillerman’s writing in 1986 in the novel SKINWALKERS. 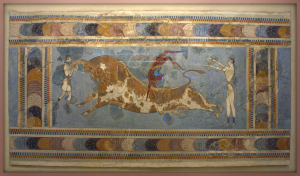 Detail from the bull leaping fresco from the Palace of Knossos on the island of Minos, photograph taken at the temporary exhibit at the Heraklion Archeological Museum, September 18, 2008, by Howard Stanbury is licensed under CC BY-NC-SA. 2001 Seldom Disappointed: A Memoir. New York: HarperCollins Publishers. 1996 Tony Hillerman: A Critical Companion. Westport, Connecticut: Greenwood Press.